At least 20,000 species of fishes live in the world's lakes, streams, estuaries , and oceans. Adult fish may be very small, such as the guppies that many people keep in their home aquariums, or extremely large, such as whale sharks that can weigh over 15 metric tons and reach 12 meters (about 40 feet). The study of fishes is called ichthyology, and scientists who study fish anatomy, physiology, and taxonomy are known as ichthyologists. Fisheries scientists and fishery biologists are scientists who are interested in the population structure, reproduction, growth, and behavior of fishes that are economically important: that is, those species associated with recreational and commercial fisheries. Fish are biologically and behaviorally well suited for their specific habitat. Body shape, feeding adaptations, and swimming behavior are examples of the characteristics unique to species. While one species of fish may be restricted to fresh water (e.g., largemouth bass), another may be found only in the open ocean (e.g., halibut). Such species are called stenohaline, meaning that they cannot tolerate much change in salinity . Many fishes, on the other hand, are found in estuaries where salinity is constantly changing. Examples of these euryhaline species are summer flounder, red drum, and striped bass. Fish that reproduce in fresh water and have offspring that migrate to the ocean where they spend their adult lives are called anadromous (e.g., Atlantic and Pacific salmon). In contrast, fish that reproduce in the ocean and whose young migrate to fresh water to grow into adulthood are known as catadromous (e.g., American and European eels). Species that do not move into and out of fresh water at certain stages of their lives vary greatly with respect to their movements. Some fish (e.g., moray eels) develop very small home ranges, whereas others (e.g., tuna) may cover thousands of kilometers as they wander the world's oceans. Fish may have skeletons made of bone, as found in most species, or cartilage, as found in sharks, skates, and rays. While the majority of fishes have scales—sometimes very tiny ones—there are some that do not have any scales (e.g., catfish). Scales may give the fish a silvery appearance, or they may contain pigment that helps the fish blend in with its environment. All fishes have mouths, which may or may not contain well-developed teeth. All fishes also have intestines of some form, but not all species have stomachs. The majority are carnivores or omnivores , although a few species are herbivores . For example, grass carp eat aquatic plants, and some reef fish scrape up algae as food. 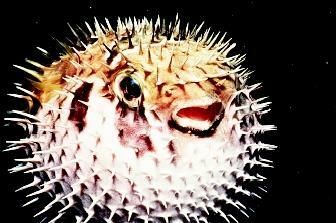 When threatened, the tropical porcupine fish pumps up its body with air or water, taking the form of a prickly sphere. Once inflated, the fish's large size and hundreds of sharp spines turn away most predators. pattern on their upper surface to blend in with the type of bottom with which they are associated. Some fish look like lumps of coral or rock (e.g., stonefish), another form of camouflage. Most fish have a well-developed swimming ability and may be able to move very rapidly. Their tails are used to provide the thrust needed for high-speed swimming. Salmon, for example, are able to leap over low waterfalls on their upstream spawning migrations. Not all fish are strong swimmers, however. The ocean sunfish, for example, can be found floating at the surface of the water in the Pacific Ocean. A large fish (up to a few hundred kilograms), it has small fins and limited mobility. Moray eels hide in holes in rocks or coral reefs and spring out to grab prey that swim by. To avoid being eaten, prey species often swim in schools that number many thousands of individuals. A predator seeing such a school may avoid it on the basis that the school could, in fact, be a fish larger than itself. If the predator does attack, it will be able to take only a small fraction of the total number of fish available. Many fish do not swim in schools but depend on camouflage, swimming ability, or the tendency to seek refuge in crevices to avoid predation. Anemone fish can live among the stinging tentacles of sea anemones. Those fish are immune to the stinging cells, so they are protected from predators. Most fish seek out their food by sight and actively search for it by swimming around. A few, on the other hand, wait for food to come to them. Anglerfish have a fleshy protrusion on their heads that acts like a fishing lure. Some anglerfish rest on the bottom, camouflaged to match their surroundings, and wave their lure until an unsuspecting smaller fish investigates. Anglerfish that inhabit the deep ocean, where light does not penetrate, have lures that glow in the dark to attract prey. Schooling behavior, as seen in this school of anchovy, often is considered to offer protection from predators. 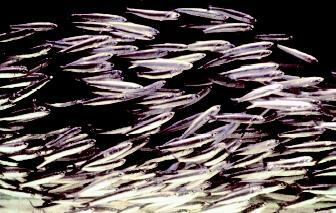 Some schools of fish can be quite large, containing many thousands of individuals. into the water column, laid in nests hollowed out in the bottom sediments, incubated in the mouth of the adult, or attached to rocks or plants in a gelatinous mass. There may be no parental care, or one or both parents may provide close attention during incubation, hatching, and even the first few weeks of life. SEE ALSO Ecology, Fresh-Water ; Ecology, Marine ; Fisheries, Fresh-Water ; Fisheries, Marine ; Fishes, Cartilaginous ; Food from the Sea ; Life in Water . Bond, Carl E. Biology of Fishes, 2nd ed. Philadelphia, PA: W. B. Saunders, 1997. Moyers, Peter B., and Joseph J. Cech, Jr. Fishes: An Introduction to Ichthyology, 4th ed.Englewood Cliffs, NJ: Prentice Hall, 1999.